We’ve moved several times and each time I’ve packed one special tree branch with us. I have had this branch so long that I can’t remember where I found it. I do know that I picked it up on one of our camping trips. Whether it was Yellowstone, Acadia, Nova Scotia or somewhere else I’ll never know. What I do know is that I kept it because I thought I could do something really special with it someday. Well, that day has arrived. 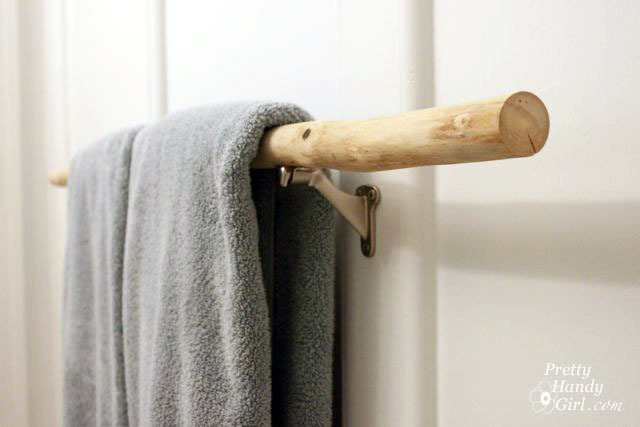 I decided to turn the branch into a towel bar for my sons’ bathroom. Start by sawing off any nubs, knots and sticks using a coping saw. Pull out the sandpaper and power sander. 3M just sent me these color coded sandpaper sheets. I think the idea of color coding them is brilliant! It really helps you grab the right grit quickly. I give them two gloved thumbs up. Stack your sandpaper sheets. Lay the sander along one edge of the papers and trace a line along the edge of the sander with a pencil. Be sure to leave excess on both ends to attach under the clips of your sander. Cut the papers along the pencil line. Load all three pieces of sandpaper into the sander (if possible). The coarsest grit (80 grit) should be on the outside, followed by the 120 grit and finally the 180 grit sandpaper. Now you are ready to start sanding! Here is a video tutorial on sanding the branch down. I’ve upped my level of professionalism, so I hope you enjoy my efforts. Coming up next. Installing and finishing the branch towel bar. Ooh, I like it! You are always full of great ideas! we been looking for towel rails we both like & hubby suggested making them out of tree branches! We have lots of ti-tree on our place with lovely strong, straight branches. Want to do 2 & maybe a holder for the toilet roll? Thanks for the vid. Loved the idea, so I made one myself! Have a look here if you want. I have linked back to your website too. Hope that’s OK? Thanks Sophie! Your towel bar came out nice!